I have been told I have sleep apnea. I don't want to wear a CPAP mask at night. Please explain more about sleep apnea and my treatment options. Sleep apnea ("a" – without; "pnea" – breath) is a medical condition in which breathing stops for short periods of time lasting from 10 seconds to over a minute during sleep. Blood oxygen levels drop and affected individuals can be jolted awake in a state of partial arousal. This can happen dozens of time during a sleep cycle resulting in poor sleep quality. Snoring, daytime drowsiness, and headaches upon awakening are some of the symptoms. Sleep Apnea is a disorder that can have a serious impact on your health. It is a common condition affecting approximately 18 million Americans. Untreated it can lead to serious consequences including high blood pressure, heart disease, stroke, work-related accidents and car crashes, and more. It can even shorten your life by several years. Continuous positive airway pressure therapy (CPAP) includes a machine that supplies a constant and steady air pressure via a hose and a mask or nosepiece. It is the most common treatment for Sleep Apnea, but like you, some people don't want to wear it. The good news is that alternative treatments like Oral Appliance Therapy (OAT) are available for the right candidates. Sleep apnea is a medical condition in which breathing stops for short periods of time lasting from 10 seconds to over a minute during sleep. Many people have Obstructive Sleep Apnea (OSA) in which the airway (windpipe) is obstructed because of a large or floppy tongue, excess tissue in the throat, obesity, nasal obstruction, or enlarged tonsils or uvula (the little "v" shaped "punching-bag" that hangs down at the back of your throat). A less common form is a neurological condition, Central Sleep Apnea (CSA), in which the brain doesn't send the correct signals to the lungs for breathing. A third kind is Complex Sleep Apnea. Your dentist can screen for sleep apnea by using a questionnaire along with a clinical examination and refer at-risk individuals to a sleep medicine specialist for a definitive diagnosis. After testing is conducted at a sleep laboratory or at home using a Home Sleep Test (HST), an index known as the Apnea Hypopnea Index (AHI) combined with the oxygen saturation level is created and a diagnosis is made. CPAP is the most common treatment for OSA. However, several studies have shown that non-compliance remains an issue because of the bulk and noise of the machine. As an alternative your doctor may recommend Oral Appliance Therapy (OAT). A prescription and referral can be made to a qualified dentist for a custom-made oral appliance. OAT consists of a plastic (acrylic) oral appliance that fits much like a sports mouthguard or an orthodontic retainer. These appliances can alleviate OSA symptoms by improving blood oxygen saturation levels and reducing the AHI. There are over a hundred oral appliances approved by the Food and Drug Administration (FDA), and your dentist can recommend and fit the best one for you after a complete clinical evaluation including an examination of your teeth, jaw, tongue, and airway. Appliances are custom fabricated utilizing digital or physical impressions of your teeth to make models, which are then sent to a dental laboratory. You will need to go to the dental office for a fitting and later for follow-ups/adjustments. The majority of these oral appliances are mandibular (lower jaw) repositioning appliances that snap over the upper and lower teeth. They utilize tiny metal hinges to move the lower jaw and tongue forward and make the airway larger to improve airflow. The vertical opening created by these appliances can range from 2-15 millimeters; they can be adjusted by your dentist for maximum relief and comfort. The rest are tongue-retaining appliances. Some made with a softer, pliable material have a compartment that fits around the tongue to hold it forward by means of suction. Another is a custom-fabricated device that holds the tongue forward like the tongue depressor your doctor uses when asking you to say "ah". These appliances prevent the tongue from falling backward and blocking the airway. 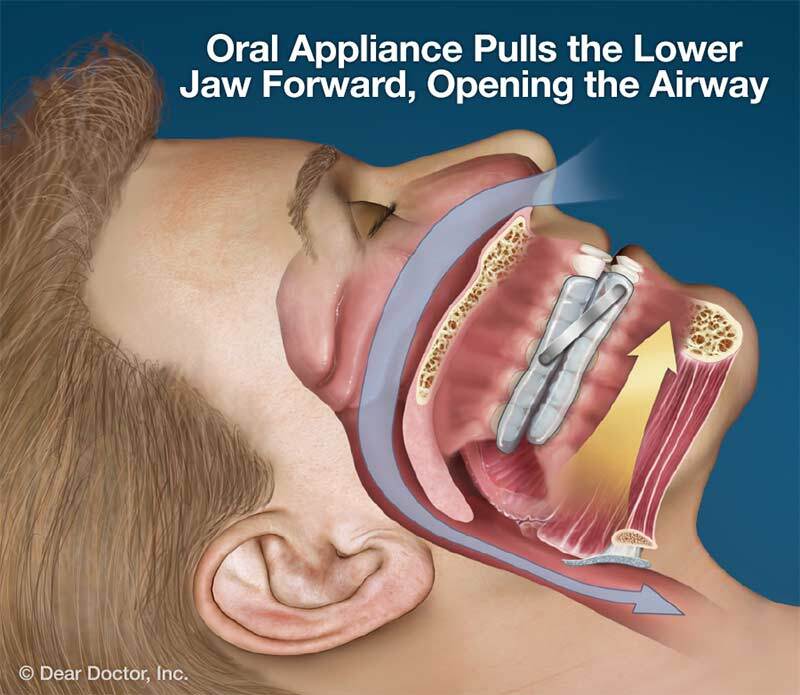 Many clinical studies have shown the effectiveness of oral appliances in treating mild to moderate OSA and also recommend their use for people with severe OSA who cannot tolerate CPAP treatment. There can be some side effects including altered bite, movement of teeth, pain, dry lips, or excessive salivation. It is important to consult with your dentist in these cases. Life-style changes including losing weight, adjusting sleep position, treating allergies, and quitting smoking can also be helpful. In some cases nose and throat surgery may be beneficial. The best treatment for OSA depends on your individual condition, tolerance and preferences. Your doctor or sleep specialist in collaboration with your dentist can decide on the best treatment option for you.